CAPE CANAVERAL, Fla. ? NASA?s space shuttle Endeavour isready for its Sunday launch to the International Space Station ? a plannedpredawn liftoff that is expected to be the last time an orbiter lifts off indarkness. The weather forecast is pristine for Endeavour?s upcominglaunch from a seaside pad here at NASA?s Kennedy Space Center. Liftoff is setfor 4:39 a.m. EST (0939 GMT), with an 80 percent chance of good weather. ?We?re in really good shape,? said Mike Moses, NASA?sshuttle integration manager, in a morning briefing. ?Everybody is ready to go.? 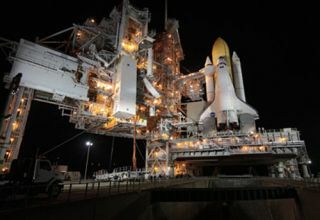 Endeavour?s launch is the first of NASA?s five finalshuttle missions before the space agency retires its aging, three-orbiterfleet later this year. The shuttle will launch six astronauts on a 13-daymission to deliver a new room and observation portal to the InternationalSpace Station.? It is the last major assembly job for the $100 billion spacestation, which has been under construction since 1998. ?Every launch is a little bittersweet because it?s onecloser to the end,? Moses said.? The new room, called Tranquility, will house station roboticarm controls, life support systems and exercise gear. It will also include theCupola, a new seven-window observation portal launching on Endeavour thatpromises to give astronauts stunning views of the Earth and space. Sunday?s predawn launch is also expected to be the last timea space shuttle willblast off in darkness. Weather permitting, it is expected to be visiblefrom much of the eastern United States. NASA?s Final Night Shuttle Launch Visible From Eastern U.S.
SPACE.com is providing complete coverage of Endeavour?sSTS-130 mission to the International Space Station with Managing Editor TariqMalik in Cape Canaveral and Staff Writer Clara Moskowitz in New York. Click here for shuttlemission updates and a link to NASA TV.